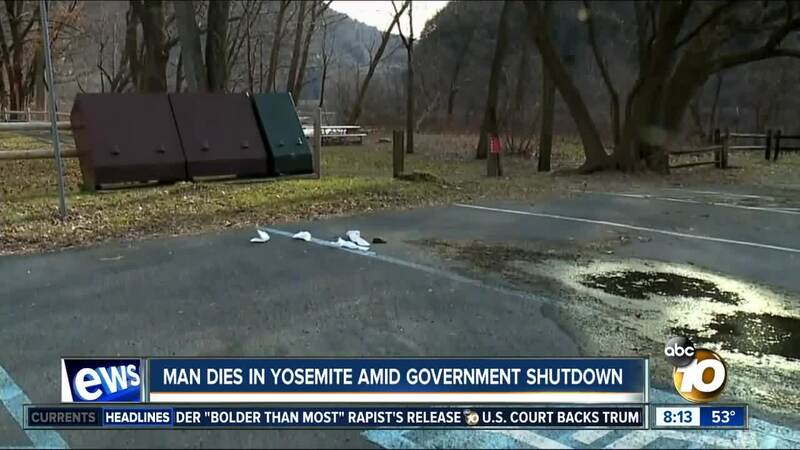 SAN DIEGO — A man has died after falling into a river at Yosemite National Park on Christmas Day. Few details about the man's death were released Friday by the park. A park spokesman told the Associated Press that a statement was not issued sooner and the investigation was taking longer than usual because of the government shutdown. The man reportedly suffered a head injury on December 25 in the Silver Apron area, between Vernal and Nevada Falls, according to ABC affiliate KGO . Park rangers arrived at the scene within an hour and removed the man from the water. Though they began first aid immediately, the man died from his injuries. The death is the third at a national park since the government shutdown began. A woman was killed by a falling tree at Great Smoky National Park on December 27 and the body of a missing 14-year-old girl from California was found on December 24 after what appeared to be an accidental fall at Horseshow Bend Overlook in Arizona's Glen Canyon Recreation Area.